Manchester United are following Parma midfielder McDonald Mariga. The Kenya international is very similar in style and stature to AC Milan star Rino Gattuso and United boss Sir Alex Ferguson has the youngster under consideration as cover for injury-plagued Owen Hargreaves. Parma sources say president Tommaso Ghirardi will demand Kiko Macheda in part-exchange for Mariga, though the chances of that happening are rather slim. Mariga started his playing career at Ulinzi Stars before moving to Pipeline FC. He was a member of the Kamukunji High School 'Golden Boys', which also included Kenyan striker Dennis Oliech (Auxerre, France), that won two consecutive National Championships in 2002 & 2003. The central midfielder went to Sweden in 2005 to play for third Division side Enköpings SK. After only one season at ESK, he signed for Helsingborgs IF before the 2006 season. His success at Olympia was immediate. Following initial interest from Portsmouth manager Harry Redknapp, McDonald Mariga looked set to sign for the Premier League team, but work permit issues held up the deal which was supposed to have cost around 2.7 million euros. He moved to the Serie A club Parma F.C. on loan in August 2007. The Italian club had an option to buy him in the summer for a fee of 20 million Swedish kronor (around €2 million). Mariga agreed to a four year deal to keep him at Serie A side Parma for four years until the end of June 2012, after the club paid a transfer fee for Swedish Kronor 18 million (approx. 1.94 million euros). The deal, brokered by former Swede great Martin Dahlin, now an agent, falls short of the 20 Million Kronnor asking price initially set by Helsingborgs. 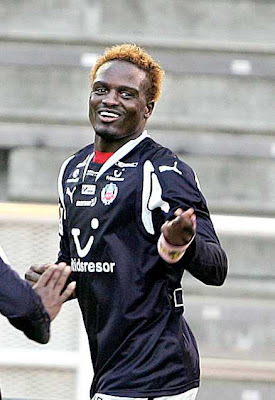 25% of the transfer fee will go to Enkopings SK, the club that first got Mariga to Sweden in 2005. Mariga, who was rated at close to 0.8M euros way back in July last year saw his price tag gradually grow to the current figure fetched in just under a year after great performances in the Italian Serie A since he moved from Helsingborgs at the close of the European transfer window last August. Mariga played 35 times for Parma in the Serie B during the 2008-2009 season scoring three time to help them back to Serie A for the 2009-2010 season.